Beautifully engraved certificate from the Florida Panthers Holdings, Inc. issued no later than 1997. 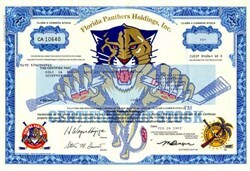 This historic document was printed by the Security Columbian Banknote Company and has an ornate border around it with an underprint of a panther breaking a hockey stick, and vignettes of the company's logo and corporate seal. This item has the printed signatures of the Company�s Chairman ( H. Wayne Huizenga ) and Secretary. 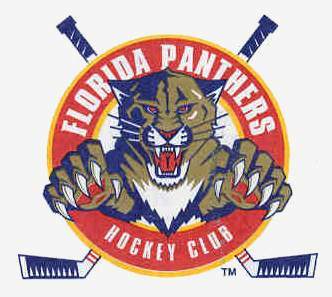 Florida Panthers Holdings, Inc. owns the Boca Raton Resort Club, the Registry Resort, the Arizona Biltmore, the Hyatt Regency Pier 66 Resort and Marina, the Radisson Bahia Mar Resort and Yachting Center and the Rolling Hills Golf Club. The company also owns the Florida Panthers Hockey Club, the Arena Development and Arena Operating Companies, the Incredible Ice Skating Rinks and an interest in the operations of the Miami Arena. The company is no longer publicly traded.